Do your palms start to sweat when you walk onto a car dealership lot? Does the anxiety you get from buying a new car make you want to just go home and do your taxes instead? Don’t worry–you’re not alone! But we’re here to help. A lot of anxiety comes bubbling to the surface when attempting to negotiate a fair deal for the car. That’s why it’s so important to know how to negotiate a fair price for the vehicle and when to walk away from the deal. Once you’ve selected your perfect car (it’s the color you wanted, it gets good gas mileage, etc. ), it’s time to go inside and start negotiating the price of the car. Usually, the salesperson will go to their manager to obtain a price and payment information on the car you selected. Then, they’ll come back to you and present the information. You can either accept the terms or negotiate for a different payment, interest rate, or extras (oil changes, warranty, etc.). This process can go on indefinitely. 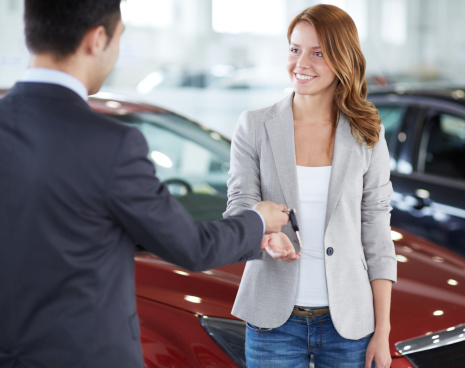 Preparing before you arrive at the dealership can give you more negotiating power! An educated buyer is a powerful buyer! You feel pressured. If you’re not ready to make a decision right now, it’s okay to visit another dealership or check out other options. Don’t let a salesperson keep you there if you aren’t ready to make a decision. A pushy salesperson likely has their own best interests in mind, not yours. You think the deal isn’t sweet enough. Of course, you may to have to compromise a little, but if the interest rate is unreasonable or they won’t budge on something that is important to you, it’s okay to walk away. You cannot afford the car. Ultimately, you are the one that will have to make payments or pay cash for the car. If the payment is going to be higher than you budgeted, walk away (yes, even if you love the car). This is such a big investment, and if you aren’t completely sold on the car and the price the dealership is offering you, there’s nothing wrong with waiting a little while to get the deal done another day. If negotiations went well and you ended up purchasing the car: congratulations! Now, just stop into any MVD Express location to take care of the title transfer and registration. There will be no stressful negotiations, just fast and friendly service to get you in, done and on your way in no time at all! We’ll see you soon!